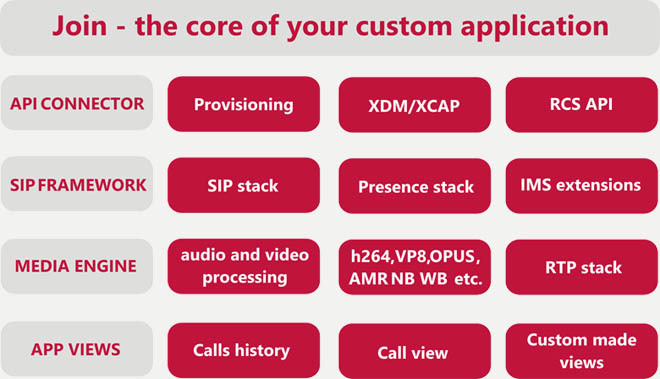 Join is a complete VoIP client framework solution enabling service providers to offer next generation OTT services like FaceTime, WhatsApp, Viber and others. The pre-integrated communication client, based on standard protocols, allows customers to focus on the user experience, GUI and add-ons, without having to know the complexities of VoIP ecosystems. We provide our expertise and years of experience in VoIP software development to help you build a great customized VoIP app tailored to your client base. Integration with any Class 5 softswitch or IMS platform. HD Audio and Video using various codecs. White label, fully brandable, custom feature-set. Join for Mobile – available on iOS, Android, Windows Phone, Blackberry. Join for Desktop – available on Windows PC and MAC.